Many women suffer from low thyroid and are on medication for the condition, but it can also be helpful to use your every day diet to keep it healthy. Is Your Thyroid Giving You Problems? Your thyroid is responsible for releasing hormones that control a huge amount of your bodily functions—it plays a role in regulating your mood, your weight, your fertility, and more. So you can imagine that when your thyroid is not working, you may experience a range of unwanted side effects. Seaweed: It’s rich in iodine, which your thyroid needs to work properly, but you can overdo it—one seaweed salad a week is plenty. Eggs: They’ve got iodine and selenium, another nutrient that helps regulate thyroid hormones. Yoghurt: Dairy is also a good source of iodine. Chicken or beef: Meats are a good source of zinc, another key thyroid nutrient. 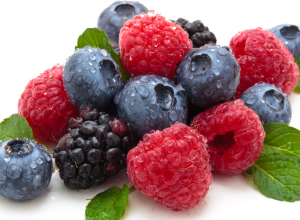 Berries: Their antioxidants protect against damaging free radicals, which are high in people with thyroid problems, and these are easy to add to smoothies or just eaten on their own. Salad: there are plenty of ingredients to choose from so why not make it one that gives your thyroid a nutritional boost? It couldn’t be more simple: foods that are rich in the vitamins, minerals and other nutrients your thyroid needs are many of the same foods that can turn a plain old salad into something super tasty. Whatever else you use as the ‘starter’ for your salad bowl, try adding some of these thyroid-friendly ingredients to the mix. Wild-caught salmon: Packed with good-for-your-thyroid nutrients — like protein, B-12, omega-3 fatty acids, and zinc — wild-caught salmon is also one of the few foods natu-rally rich in vitamin D, a crucial vitamin for thyroid function. Fresh salmon is great, but also look for canned wild-caught salmon that you can add to your salad as you would tuna. Sea vegetables: Seaweed is a rich source for iodine, your thyroid’s basic building block for producing its hormones. Crumble a sheet of roasted nori (used to make sushi rolls) to give your salad a mild, nutty flavor. Or try kelp, commonly sold in powder/granule form. Sprinkle as you would cracked pepper or other herb seasoning. Arame seaweed looks like black wiry pasta and has a more pungent flavor. Soak arame first to soften, then chop to matchstick size for a salad garnish. Because of sea vegetables’ high iodine content, a little can go a long way. Brazil Nuts: Eating just two Brazil nuts a day can give you a big boost of the mineral selenium, a major component of your body’s ability to create and use thyroid hormones. Before adding to your salad, chop or crush nuts first. Have a nut allergy? Other salad-friendly food sources for selenium include grass-fed beef, boneless turkey, chicken, and eggs. Sesame Seeds: Hidden inside these tiny little seeds is a large helping of zinc, the mineral responsible for converting thyroid hormones into the active form your body uses. Sprinkle seeds liberally on your salad for added flavor and texture. Not a fan of sesame? Try pumpkin seeds instead for similar nutritional value. Shiitake Mushrooms: Your thyroid needs iron to aid in hormone production, as well as copper, to stimulate the thyroid, and keep hormones balanced. Shiitake mushrooms are considered good sources for both minerals. Iron and copper work in synergy, too, as copper helps us more easily utilize iron. To add fresh shiitake mushrooms to your salad, wash thoroughly and cut into thin slices. Can’t find shiitake mushrooms, then look for“baby portabella” mushrooms as they offer similar benefits. Greens: Spinach, kale, and other leafy salad greens are nutritional powerhouses, and good sources for thyroid-friendly B vitamins, vitamin C, and iron. However, most greens also contain compounds known to hinder thyroid function. As with everything, try to strike a balance. Many thyroid enthusiasts find that when your diet is filled with foods that are good for your thyroid, the benefits of greens far outweigh any negatives. If you do have low thyroid, lightly steaming greens first can help. Another option is to use Butter or Romain lettuce, both of which are naturally lower in these compounds. Whisk ingredients in a bowl. Makes 10 servings. Store in a glass sealed jar and keep in the fridge, which will harden the oil. Before using, run the jar under warm water until contents are liquid. Shake well.